Arizona is already sweltering, thanks, but piping hot macaroni and cheese never fails to lure me with its siren song. 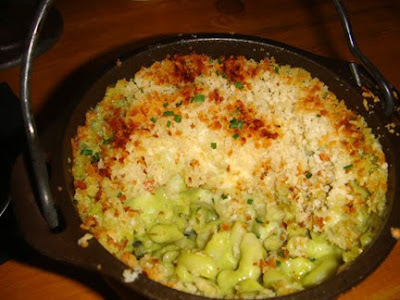 On a recent visit I decided to check out the highly recommended Green Chile Mac And Cheese at Roaring Fork in Scottsdale. I wasn’t expecting comfort food nirvana from a restaurant whose name is subtitled “An American Western Bistro and Bar,” but it just goes to show you that you should always keep an open mind because great mac can happen any time, any place. First, though, you have to find the joint. Roaring Fork is not easy to locate although its address seems straightforward. Turns out it is hiding in plain sight, marked by a rusted, vaguely Craftsman-looking pierced-metal portico that’s slapped onto a tucked-away corner of a nondescript, sprawling granite and glass office building. At least when you find the restaurant your patience is instantly rewarded with ample parking. I arrived during Happy Hour and took my place on a barstool at a high table near the bar, where I could oversee what everyone around me ordered (I’m kind of obsessive about this) and peer through the kitchen pass. My waiter suggested a huckleberry margarita – I was skeptical but, when in Rome…and it was delish! 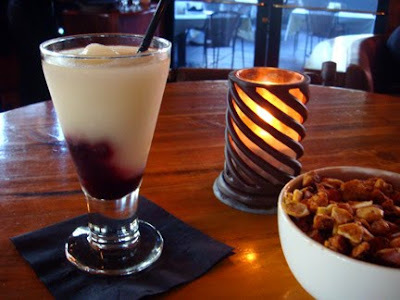 The glass arrived bearing an ample portion of strong, familiar lime margarita slush with a dollop of huckleberry puree lying in wait at the bottom of the glass. With your classy black straw and a minimum of slurping, you can hoover up the two flavors in whatever ratio makes you swoon. The puckery margarita and the sweet berry puree keep each other in check. And I know it was Happy Hour but I was still shocked when the bill arrived and I learned this delicious original cocktail only set me back $5. I’ve lived in Los Angeles too long. While I enjoyed the margarita I picked at the bowl of munchies on my table. Who offers this anymore? Doesn’t the health code prohibit random unprotected fingers dipping into community bowls now? But never fear, because these sturdy pretzel chunks, delicate hexagonal oyster crackers and ordinary peanuts are coated with so much cayenne-based spice mix, any bacteria you may inadvertently transfer to the dish of snacks will be wiped out by the pungency of it all. Oh my, what a great flavor punch! Addictive. I wasn’t expecting to be swept away by such humble ingredients. And the combination of spicy nosh and icy, sweet quaff was heaven on a blistering hot day. While I scarfed down the munchies and waited for my mac, I noticed that the cow skull hanging over the bar is wearing a pirate eyepatch. That’s a pretty good metaphor for Roaring Fork, I think: there’s a sly dose of irreverence along with the Western stylings in the food as well as the décor. Finally – the main event arrived at my table in a cute little cast iron tripod kettle. And when I say “little” I mean it held enough food to serve at least two people, maybe four as a side dish. But I devoured the whole thing because this is some delicious macaroni and cheese and, hey, it’s my job, right? …Because the next thing I noticed is that this macaroni and cheese is green. Dun dun dunnnnnn! I could hardly believe my eyes. In the dim light of the antler chandelier, I squinted to get a better look. 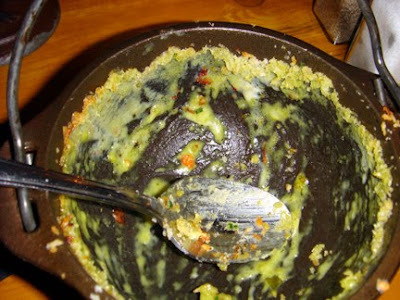 But it was true: The perfectly cooked elbow macaroni is nestled in a kettle of molten pale green goo. My mind reeled at the possibilities. The actual macaroni itself can’t be green, can it? And that’s when I did the unthinkable: I laid a single noodle on my tongue and sucked mightily to relieve it of its sheath of cheesy sauce, then spat it (in the most ladylike possible way, I assure you) into my napkin for scrutiny. Nope, the pasta is the usual color. So it’s the cheese sauce that is green. I wasn’t sure whether to be relieved or disappointed. But any letdown was short lived because this macaroni and cheese is so very satisfying. It’s got the perfect balance of sauce, noodles and crunchy crumbs and would be a strong contender for the weheartmacandcheese crown, even without the magical addition of green poblano chiles. Which are roasted and pureed, I learned. Aha! That explains the moist consistency as well as the unexpected color. The flavors hit all parts of your tongue and compel you to take just one more bite…and another… It’s intensely flavorful but the creaminess keeps it from burning. A masterful sauce! As the well-calibrated chile tingle spread to my lips, I could only smile dreamily and keep going. In the name of journalistic integrity, of course. As I returned the serving spoon to the kettle again and again, I noticed a couple other things about this remarkable macaroni and cheese. I’m almost certain the breadcrumbs are panko and they are laced with finely minced chives. 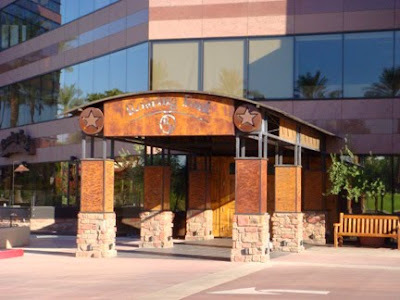 And I must admit that, while the cast iron serving dish kept it nice and hot, once it was transferred to my plate the sauce gummed up a bit quicker than I would like – but that’s because all of Scottsdale is air conditioned within a few degrees of freezing (and for that, we are grateful). Would I?! Duh! A few minutes later the restaurant manager arrived, bearing an envelope which he playfully slipped to me under the table with a wink. 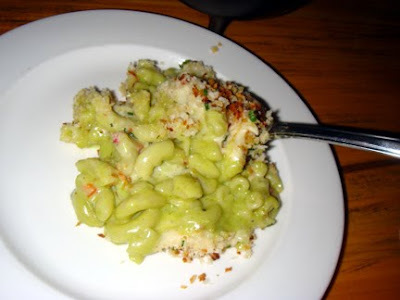 I didn’t look at the recipe until I got back to the hotel, but two things jumped out at me: First, the only cheese in this mac is pepper jack, a nice white cheese which allows the chile puree to impart that surreal greenness to the sauce. And, like any shared recipe worth its salt, they left out a key ingredient – there’s no mention of breadcrumbs at all, so when I prepare it I will have to follow my panko hunch. And you can bet I’m going to give this recipe a whirl! Although...the more I look at the recipe, the more I doubt it will result in the lush and creamy dish I enjoyed at the restaurant. The proportions just seem off. But hey, if I prepare the recipe and it doesn't turn out great, that's just a good excuse to go back to the restaurant, and try more menu items too. No great hardship. I definitely understand how Roaring Fork’s macaroni and cheese earned its reputation as the best in the valley.